The Sensorites begins with an incongruous scene which features our heroes fondly remembering all their adventures together so far, although nobody mentions the weird one with the scissors. However, when Barbara waves away her experiences in Mexico with a vague shrug, Sue isn’t very happy. Sue: “I’m over it now?” That was a bit quick! Me: Perhaps a significant amount of time has passed between the two stories? Sue: Well they can’t have done anything interesting or they would have mentioned it during their ‘previously on Doctor Who’ recap. Never mind that, the action has shifted to an eerie spaceship which seems to be piloted by two corpses. The Doctor immediately takes the initiative and looks for an excuse to leave. Sue: Five minutes ago he was banging on about a great spirit of adventure, and now he wants to run away at the first sign of danger. Where’s his scientific curiosity gone? 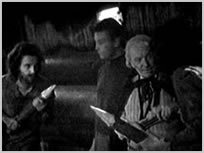 Sadly, before we can all escape to a nice historical, the ‘corpses’ wake up (“Great diagnosis, Doc!”), and our heroes are waylaid as a mysterious figure cuts the lock out of the TARDIS. Sue: Hang on a minute. I thought the TARDIS was indestructible. How can you take its lock out like that? How rubbish is that? What makes it even worse is that it’s happening when they’re standing two feet away from it! They can smell the lock burning but no-one even glances at the TARDIS. Rubbish! Me: The Sense Sphere is just over the road from the Ood Sphere. You know, where the Ood come from. Sue: If you say so, Neil. 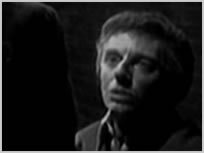 Sue loves the fact that poor, mad John looks like Roger Taylor from Queen having a bad trip, and she’s completely gobsmacked when Hartnell takes control of a spaceship. Sue: The Doctor is actually doing something heroic! He saved the day! I can hardly believe it. And then Sue makes me pause the DVD because the high-pitched whining emanating from the advancing Sensorites is tormenting our pets. Our dog, Buffy, is whimpering and clawing at her ears, while our cats pause to scowl at us before sauntering off to find a quieter room. Sue: I thought this one was supposed to be rubbish? It wasn’t that bad. In fact, I quite liked it. It was very noir and grubby. Me: That’s probably because it hasn’t been vidFIREd yet. Sue: Did they decide not to vidfire it (she doesn’t get the capitalisation) because the fans don’t rate this story very highly? Me: Don’t worry, Sue, I’m sure they’ll polish this turd eventually. Sue is very taken by the Sensorites, even if they are wearing romper suits and have dinner plates for feet. Sue: When they put their stethoscopes to their heads, they remind me of those Russell T Davies monsters with the spaghetti coming out of their mouths. Me: The Ood. Yes, I know. I told you yesterday, they’re practically neighbours. Sue: Did you? That’s interesting. I think they’re a pretty good alien for the time. I’m sure this would have frightened kids in the 1960s. They have a cool name as well. Me: When I saw pictures of the Sensorites in books, back when I was a kid myself, I thought they were the best monsters ever. 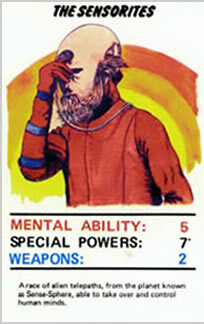 They looked really eerie and threatening, and there’s this Top Trump card from the 1970s where they look amazing. And then I finally got to see the episodes in the mid-90s – you’d already gone to bed – and they were a crushing disappointment. Sue: What’s so bad about it? It’s fine so far. What happens to make it so terrible? Me: I haven’t seen this in years. Sue: Why not? You’re always staying up late to watch this stuff. I can hear the theme tune playing downstairs when I’m trying to sleep. Me: Because, Sue, even in my darkest hours, I’ve never found myself in a situation where I’ve ever wanted to watch The Sensorites again. Sue: But I thought you liked everything about Doctor Who? Me: I don’t like all of it! It isn’t possible to like all of it. That would be insane. Anyone who tells you otherwise is either lying or incapable of critical thought. Sue: But you’ll still buy this story when it’s released on DVD? Me: Of course I bloody will. Now hush, we’re missing an exciting bit in a corridor. In an attempt to keep boredom at bay, I ask Sue to play a little game with me. Me: You see that Sensorite over there? Yes, the fat one who hasn’t said anything yet. Well, I’ll give you a foot massage if you can tell me who he is. I’ll even give you a clue: he’s best known for co-hosting a popular children’s TV programme in the 1960s and ’70s. You’ll want to shout its name out when you get it. Sue: Is it John Craven? Sue: Is it John Noakes? Sue: Is it Brian Cant from Play School? When Sue isn’t dredging her memories for 1960s children’s entertainers, she’s seeing odd patterns in the narrative. Sue: This is a bit like Avatar. As I finish mopping up the tea I’ve spilt over myself, I pluck up the courage to probe her further. Sue: Well, it isn’t in 3D, obviously, and the aliens aren’t blue. Me: Their costumes might have been blue, actually. Sue: Well there you go, then! It’s exactly the same thing, it just features a different rare mineral. I don’t understand why you’ve been so reluctant to watch this one. It isn’t bad at all. You should keep an open mind. The episode concludes with an attempt on Ian’s life. At first Sue believes William Russell is choking on his water by accident, so it comes as a bit of a shock when he finally keels over. However, given that Ian is clearly Sue’s favourite character, I expected her to show a little more concern. But no. Sue: I’ve got it! Is it the bloke with the beard from Fingerbobs? It’s Valentine’s Night, and that can mean only one thing – it’s time for The Sensorites episode four. I would like to digress for a moment so I can clarify a couple of things. Firstly, Sue is responsible for keeping this experiment on track. Without exception, she’s been the one who’s suggested that we watch our daily dose of Doctor Who every day. 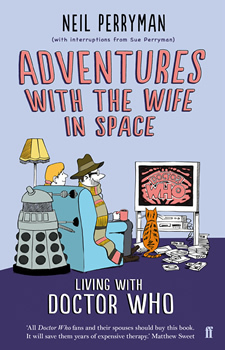 If it were up to me, we’d still be on Skaro. In short, I’m not forcing her to do anything. Secondly, I lived in a static caravan for THREE AND-A-HALF YEARS for Sue. We didn’t have a working telephone for the first 18 months, and I had to put up with a dial-up modem when we did. Sky Plus was a pipe dream, our toilet would freeze over in the winter, the rain sounded like someone dropping nails on the roof, and I shared this cramped environment with two kittens, a fully grown Labrador and a teenage daughter. Sue built a lovely house, I’ll give her that, and I’m sure I’ll look back on those years we spent in the Lyndhurst 2000 with a mixture of pride and nostalgia one day, like an ex-con reminiscing about doing bird in Pentonville. But trust me, watching The Sensorites episode four is a walk in the park compared to having to cook in your own living room. Oh, who am I kidding? It’s The Sensorites episode four! Sue: Is it a young Keith Chegwin? Sue: Is it one of the Corbetts from Sooty and Sweep? Me: (Resigned) It’s Peter Glaze. Sue: Who the hell is Peter Glaze? Me: Crackerjack! You know! Peter Glaze! The short fat one with the glasses. Peter Haining pretended to interview him once. Sue: How the hell am I supposed to know it’s Peter ****ing Glaze? I demand a foot massage! Now! Well, it is Valentine’s Night. What’s that? We didn’t review The Sensorites episode four? Oh get a life. If there’s one thing The Sensorites has taught Sue, it’s this: William Hartnell isn’t the only one who can make mistakes. In fact, the story has been a showcase for fluffs, stammers and technical errors, from grams not being faded down quickly enough, to the faint echo of floor manager chatter drifting over the actors’ mics. 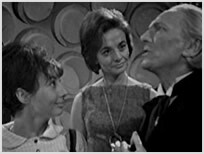 The fact the guest stars are stumbling over their lines makes Sue appreciate just how good William Hartnell can be. And he’s pretty good in this. 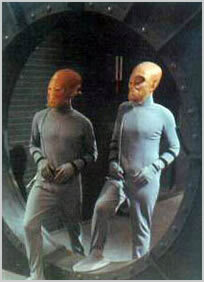 Sue: If I had one criticism of this story, it’s that the Sensorites all look the same to me. Sue: It’s not my fault! I know they’re using sashes and collars to differentiate them from one another, but they keep getting promoted. There’s even a subplot about what the Doctor is wearing. The writer is obsessed with haberdashery. Sadly, the entire plot revolves around remembering which Sensorite is which, especially when our heroes accidentally promote the bad guy. In fact, I’m sure this sailed right over Sue’s head at the time, although one detail did grab her attention. Sue: Heart! The Doctor just said, ‘My heart’. I thought the Doctor had two hearts? Me: Yeah, there’s no way around that. It’s been suggested the Doctor doesn’t get his second heart until he regenerates. Sue: By that logic, the Doctor would have 11 hearts by now. His rib cage must be awfully crowded. Sue: Susan’s very good in this. She’s written as a real person, and not as a 12-year-old child. My wife is impressed when I tell her Susan’s description of her home world (silver-leafed trees and a burnt orange sky) will be referenced by both Paul McGann and David Tennant later in the series. Our first cat was called Gallifrey, and we both remember welling up the first time David Tennant mentioned him by name not long after he died. But I digress, because Ian and the Doctor have stumbled upon a bunch of humans who are waging a misguided guerrilla war against the Sensorites. Sue: I don’t believe it! They haven’t got real names, either! Everyone’s called ‘One’ or ‘Two’, or ‘First this’ and ‘Second that’. Didn’t the writer have a book of baby names he could draw upon? And why are the humans carrying giant pencils? As the story limps to its rather lame conclusion, we are treated to a marvellous moment where the Doctor and Susan discuss a possible return to their home planet. Sue: So is that the story arc for the entire series – the Doctor trying to find his way home? Me: Yeah, I suppose it is. Sue: Well, that was all right. I didn’t have a problem with it, and if that’s the worst you can throw at me, we’ll be fine. Sue: I think I liked it more than you did because it wasn’t vidfired. I liked the fact that it looked old and battered, because it hid some of its imperfections. Yeah, it was fine. Wow. Not only did we make it through my own personal blind spot, Sue can’t wait to carry on. Sue: Right, so where are we going next?